The infinity of space awaits - make your mark on the universe. Welcome Traveller, to the outer edge of a vast and wondrous galaxy, teeming with unknown species, planets packed with unimaginable flora, fauna and mysterious intelligent alien races. As you travel from one star system to the next and plot your course across a vast galactic map, an unknown force pulls you towards the centre. The universe of No Man’s Sky is filled with planets: an unimaginable 18,446,744,073,709,551,616 (18 quintillion) to be precise. Each of them is unique, from their vast landscapes to the creatures that roam them, the plants that grow on their surface and the resources that can be mined. While no Traveller will ever see every planet in the universe, each world you discover is available to visit, explore and name as your own. Chart a course from the depths of space, seamlessly enter a planet’s atmosphere, find somewhere to land your ship and begin your search for its beacon. Every planet is home to complex ecologies of animal and plant life, and as you explore, you’ll discover things that no one else has ever seen before. Everything that you encounter – from planets, to creatures and plant species – is yours to name, providing you’re the first to discover it. Some creatures will be docile, others aggressive and dangerous – but until you discover them, you’ll never know. 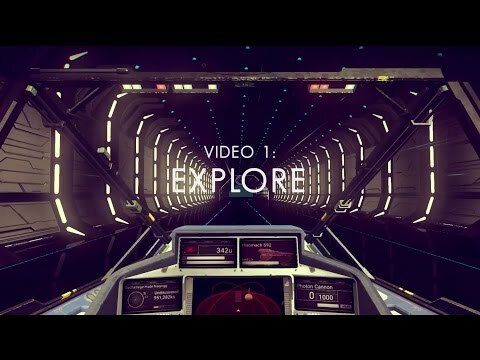 Upload your discoveries and leave your mark on the universe for all to see, and earn a few Units for your efforts - allowing you to make a living exploring the unknown. While planets may be unexplored, they’re not uninhabited. Your journey through the galaxy will bring you into contact with other intelligent life forms, and it’s up to you how you interact with them. Each race has their own distinct language, which can be learnt word by word through your interactions with them and by discovering ancient structures. Unlock their vocabulary to become more informed on their mysterious enquires, strengthening your chances of successful communication, making more profitable trade deals and raising your standing with their race for future encounters.